Trying to register at mylife didn't go so well. 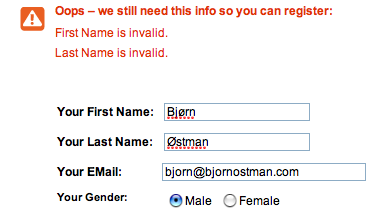 I know it's silly of me, but I'm a tiny bit insulted at the notion that my name is invalid. It's also embarrassing for mylife that they can't handle silly Danish characters. That's not a problem on facebook, for example.